In very good condition generally overall, marked to Paris cutler, a French 1822 Model light cavalry officer's sword / sabre. Marked "G. BARRE A PARIS" to the blade forte, this 1860 version of the 1822M means the sword was made between 1873 and 1882. The spine of the blade marked "Coulaux & Cie Klingenthal". The superb 36 inch blade is in very good shape and firm in the hilt. The hilt retaining much original gilt. The grip complete and generally good, but three turns of twisted wire ring bindings have been glued, presumably they were coming loose; probably could be much improved with care. 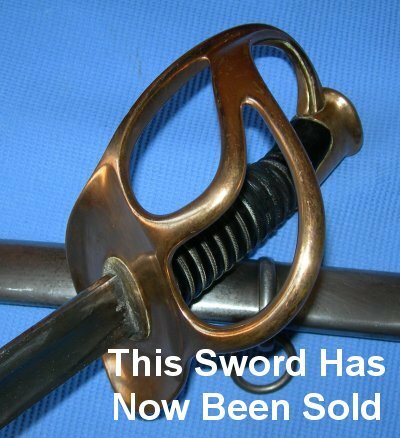 The steel scabbard is in very good order. The blade sheathes and draws very well. A very good buy at £350. Further / full sized photos available upon request. Please quote our item Ref: B68 (571).